The temple, Hogonji,was founded on the island by the priest Gyoki(668-749), after he received an imperial edict delivered by the imperial messenger. The Imperial edict was issued in the first year of Jink(724),after the Emperor Shomu (reigned 724-749) received a divine message from Tenshoko daijin (Amaterasu O Mikami),the Sun Goddess. The divine message was that there isi a small island in the middle of Lake Eshu(Lake Biwa) where Benzaiten, the God of wealth,music and eloquence,came down the earth. If a temple were to be built on the island to commemorate this, it would be of great benefit to the people and bring about peace,prosperity and bountiful havests. 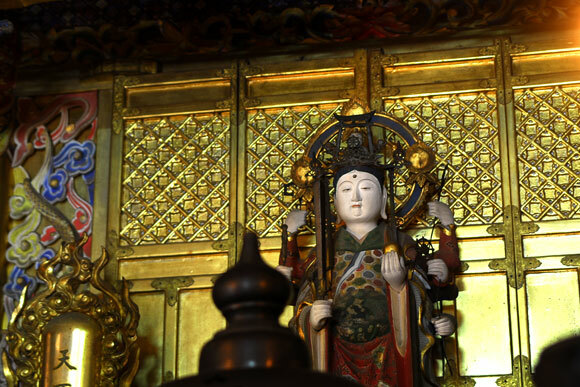 Gyoki Bosatsu came to the island in obedience to the imperial edict and first, built the Hoden(Shrine),himself carved the image of a female Benzaiten, and enshrined it in the Hoden as the main image. He then built a second Hoden in which he installed an lifesize image of Kanzeon Bosatsu, a thousand-armed,thousand-eyed Goddess of Mercy. Since its fonunding,there have been several Imperial visits and many visits by famouse priests, including Dengyo Daishi(Saicho 767-822),Kobo Daishi(Kukai,774-835),and Jikaku(Ennin,794-864). Accounts of their activites and religious austerities can be found in the records of the temple. 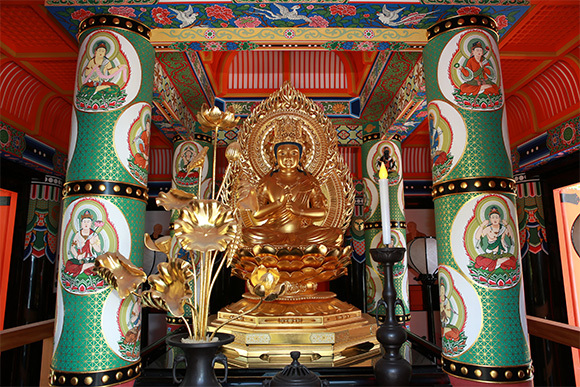 Thus,the Buddhist tradition has been carried out on the island continuously for more than one thousand,two hundred and fifty years, until today. Over the centuries there have been some calamitiew due to fire ,earthquake and historical transitions, and the number of buildingsis but a shadow of what it once was. The Kannon Do was was moved here in the eighth year of the Keicho Era(1603), by Tokyotomi Hideyori(1593-1615)in accordance with the will of his father, the Taiko(Toyotomi Hideyoshi, 1536-1598),Hideyori appointed Katagiri Katsumoto(1556-1615), Shounal Bulding Administrator, to move the building from Hokokubyo,in Amida-ga-MineHgashi-yama, Kyoto, to its present site at Hogonji. TheKara Mon (Chinese Gate), which is a representative achitectual relic lf the splendid and gorgeous Momoyama Style, is a National Tresure. The coverd passageway which is built into the cliff was actually constructed from Hideyoshi’s boat, Nihon-maru, and is called the Boat Passageway(Funa-roka).It is designated an Important Cultual Propety. 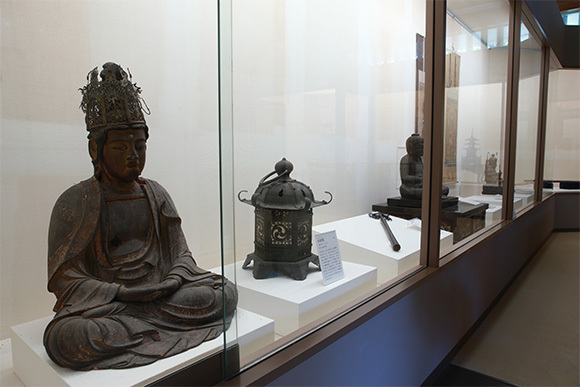 The present Benzaiten Hondo was renovated in Showa 17 (1942)and is, along with the Amida Do of Hokkaiji in Hino,Kyoto, and the Itsukushima Jinja(Shrine) in Hiroshima, a great palace in the style of the Lake Heian(Fujiwara) Period(898-1185). 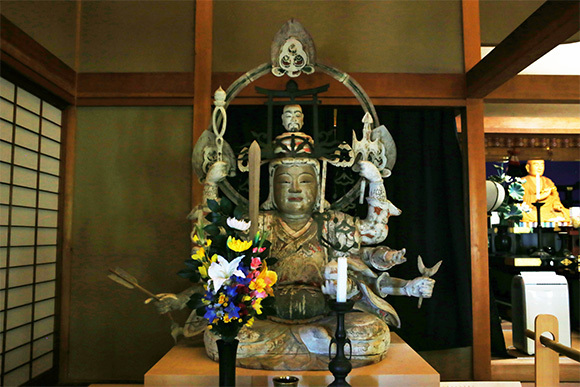 The image of Benzaiten is, together with those at Itsukushima and Enoshima(in Kamakura), one of the Three Benzaiten in Japan, but the Honden here is the true location of the coming of Benzaiten to Japan. 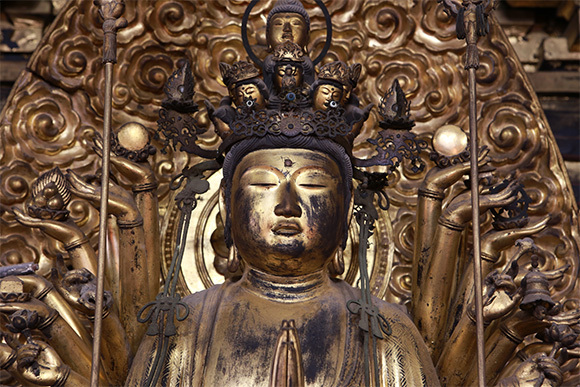 The Kannon Do, as the Thirteth Amulet Issuing Office of the Thirty-three Sacred Kannon Temples of Western Japan is shrouded in the incense and resounds to the chanting of the songs of the pigrims who come from far away and cross the lake in a never ending stream. Copyright(C) 竹生島 宝厳寺 All Rights Reserved.